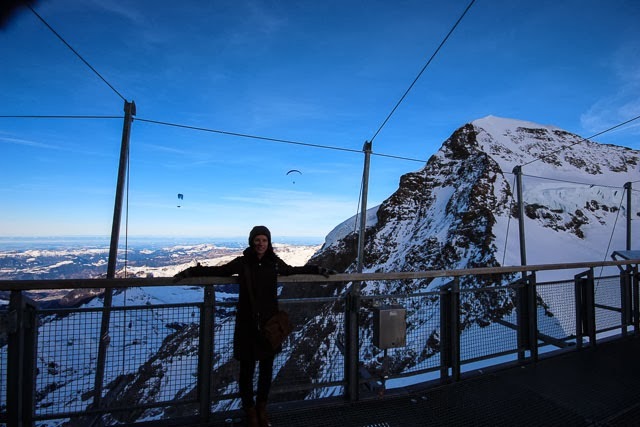 While staying in Grindelwald, we had asked around what the most popular things to do or see in the area, aside from skiing, visiting the "Top of Europe" was consistently mentioned. 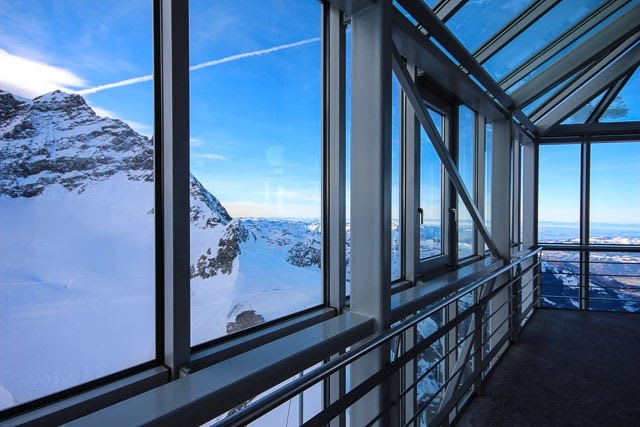 The Jungfraujoch is the highest railway station in Europe at 3454 metres above sea level and it can be reached from either Grindelwald or Lauterbrunnen. The idea itself was born in 1893 by Adolf Guyer-Zeller with construction actually beginning in July 1896. As one can imagine, the work was intense & dangerous and in the 16 years it took to complete, many lives were lost but on August 1, 1912, Europe's highest train station opened. 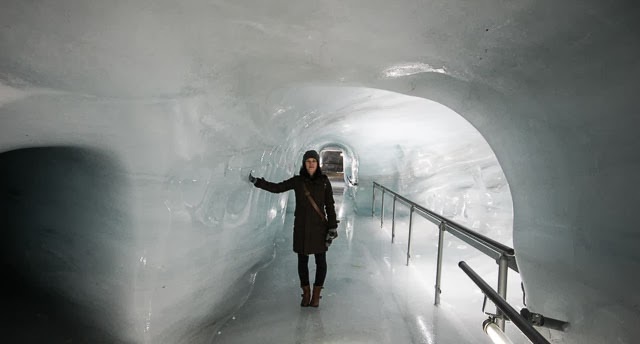 The entire process cost 16 million francs, double what was originally estimated - perhaps that's why the round trip ticket to visit today is so damn expensive! 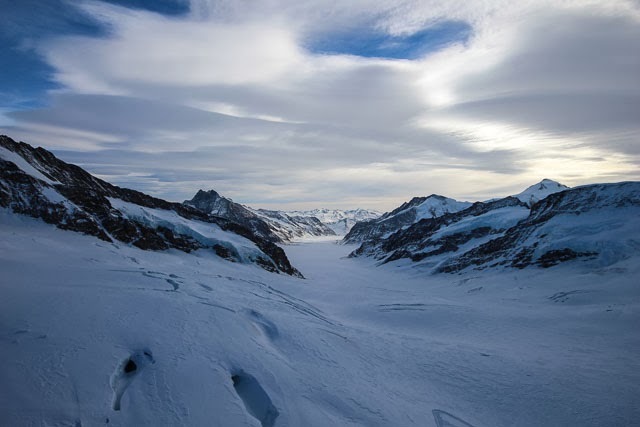 The night before we planned to take the journey up, we dined with a lovely Swiss couple in Grindelwald and upon stating our plans for the following day, they mentioned the ticket was expensive, even for the Swiss who are used to the high costs in the country. Joe and I brushed it off as we too are used to high prices in Norway but neither of us were prepared when the cashier at the train station told us the round trip cost for the two of us came to 354 francs (that's 425 CAD.) Somewhat in shock, we paid and hoped the trip would be worth it. We boarded the first train at the main station in Grindelwald along with other skiers and a handful of tourists (it was the low season, after all.) The first stretch took us up the side of the mountain to Kleine Scheidegg where we all exited the train - the skiers heading off to the hill and the rest of us, boarding the second and final train which would take us to Jungfraujoch. The second leg is a little less scenic than the first as the majority is within the mountain but there are a couple of stops giving just enough time to take a look out the viewpoints. Once at the top, there is a self guided tour to follow with the highlights being an ice 'palace' and the Sphinx Terrace. 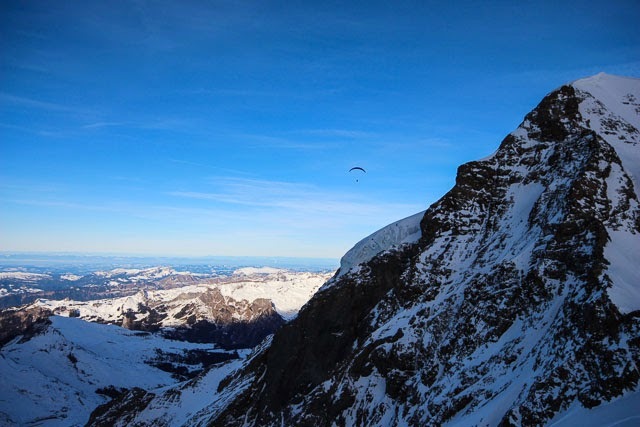 While we were taking in the views, three paragliders drifted over the Alps which both amazed and terrified us. The wind at the top was biting so our time outside was limited but nothing could beat those views. 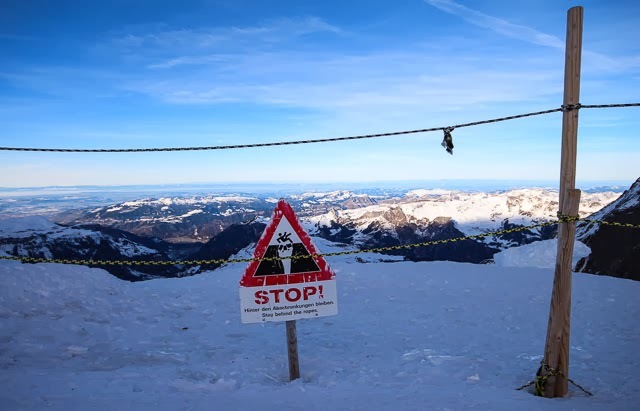 We most certainly felt like we were at the top of Europe. We also dined at one of the restaurants which was as one expects in these sorts of tourist spots - a little overpriced, ok food but fantastic views - before boarding the train for the return trip down. The final leg from Kleine Scheidegg to Grindelwald was stunning as we watched the sunset leaving the sky pink and purple over the Alps. Unfortunately, the train didn't provide ideal photo-taking opportunities but it was breathtaking. So… was it worth the hefty price tag? Well, I suppose that depends on what you're expecting. We were happy to have visited during the low season as the experience might have been less enjoyable if we were fighting crowds but that being said, a few of the activities (sledging & hiking) weren't open. The views were most definitely unbeatable and because we weren't spending a lot of money on other activities throughout the trip, we were fine to splurge on it. 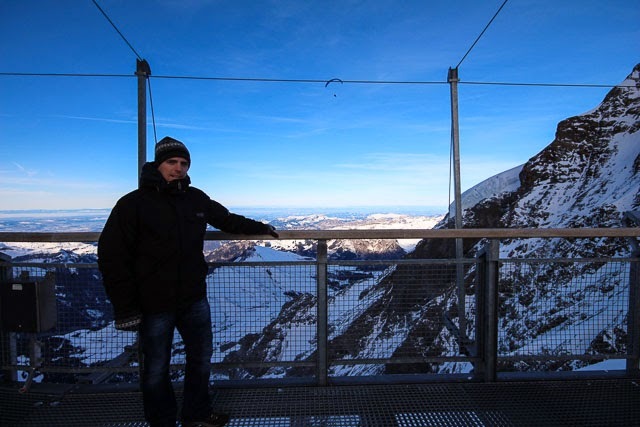 Besides, it's quite fun to say that you were on top of Europe. Holy shmoley, that IS expensive. You would think in low season they would discount it? Wow, expensive but truly a once in a lifetime experience!!! The view look incredible! Wow, that is quite a price tag but the views look like it was totally worth it! 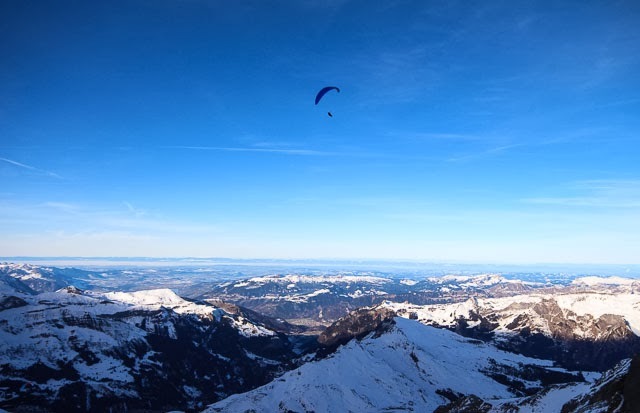 Also, I would love to trade places with those paragliders! What an incredible place to do that! Aaaaand this goes on my bucket list pronto. Your photographs are stunning - the upside to the cost of the adventure: wall art! Enjoying your blog as a new reader. Bravo! Wow. These pictures are amazing! Even though some of the stuff was closed, I think not having to fight the crowds is worth it. You get that view all to yourself! Wow, that is super expensive but I think if it's a one off, then I can always justify it! Such gorgeous photos. 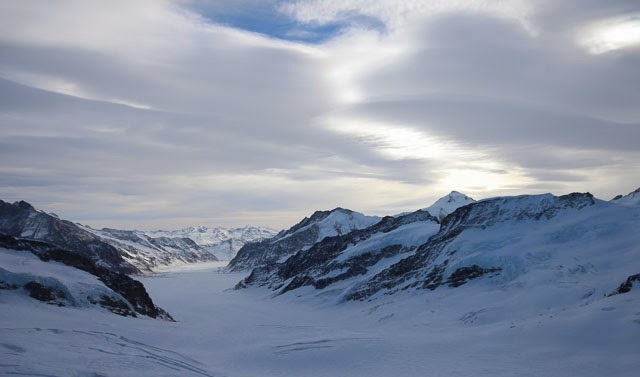 I remember seeing a documentary about the Jungfrauenjoch last year and it left me very fascinated with the whole project - the work, the ambition and what it meant for the beginning of tourism in the Alps are quite amazing. I would love to visit myself one day! It might be a splurge, but as you said, 'it's quite fun to say that you were on top of Europe'!